Patient demand for dental restorations with a natural esthetic has increased considerably over the past few decades. This is partially due to greater interest in and awareness of cosmetic dentistry. For many years, clinicians used PFM crowns and bridges to provide patients with durable, long-lasting restorations that offered reasonable esthetics. However, although still a popular option, the opacity of the PFM materials cannot always satisfy esthetic demands. The earliest all-ceramic materials provided better treatment outcomes but lacked the strength required for bridges and posterior crowns. 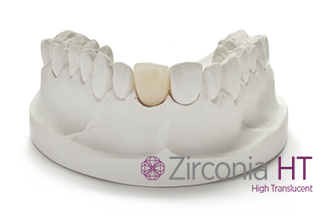 When zirconia was first introduced, it gave clinicians a much stronger alternative. Although the higher crystalline content found in the original zirconia materials provides much better flexural strength, it also increases the opacity of the material, diminishing esthetics. The development of pre-shaded zirconia and the introduction of newer materials helped to overcome some of zirconia’s earlier limitations. With the evolution of zirconia materials, zirconia-based restorations have been more frequently used. We now have a much better understanding of the characteristics and physical properties of zirconia, and that knowledge has led to more predictable long-term treatment outcomes. Until even a few years ago it was challenging to produce a zirconia restoration that accurately replicated the natural translucency and opalescence of real teeth. Now, the newest generation of materials can provide patients with even better treatment outcomes due to increased translucency, better wear characteristics, and strength. With significantly improved translucency, the technician can fabricate restorations that more closely replicate natural teeth. 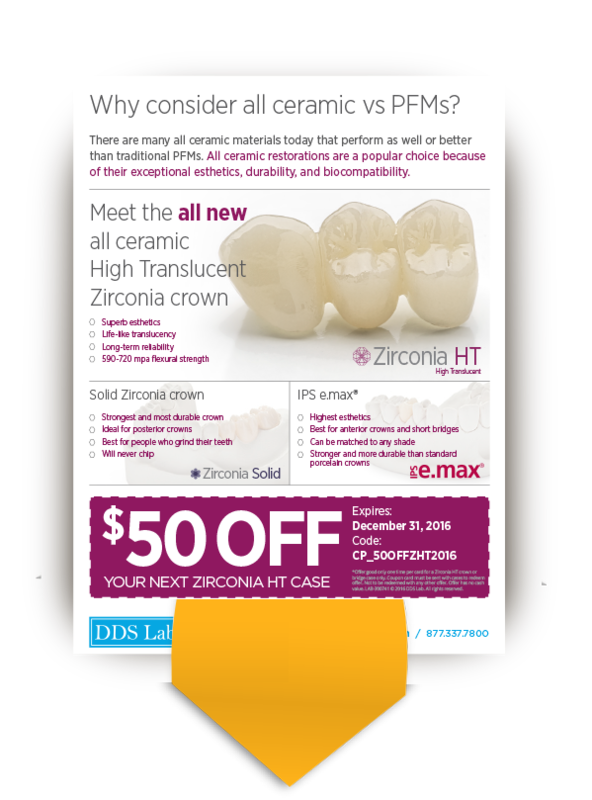 High translucent zirconia provides clinicians and patients with more consistent and more esthetically appealing treatment outcomes, while retaining a vibrant and natural translucency. High translucent zirconia is a versatile material and can be utilized for single anterior and posterior restorations, for bridges up to three units, and for implant crowns. It seems like it should be the perfect material for dental veneers, but, unfortunately, this isn’t the case because of the margin’s high visibility and the prep thinness. Margin visibility also contraindicates its use for inlays and onlays. High translucent zirconia restorations are easy to fit and can be cemented using standard cementation materials and techniques. All-ceramic materials have differing compositions, crystalline contents, and microstructures that influence strength and translucency. The more translucent materials, like IPS and e.max, which contain glass, provide excellent esthetic results but have a lower strength compared with zirconia. Lithium disilicate is extremely popular, with good reason, as, in the hands of a skilled technician, the crowns can look amazing. However, the flexural strength of high translucent zirconia is considerably higher than that of lithium disilicate. Although lithium disilicate is suitable for three-unit anterior and posterior restorations, high translucent zirconia offers the clinician and the patient an alternative. High translucent zirconia is still a very new material and hasn’t yet been extensively studied. One recent in-vitro study, which assessed the optical properties of these more modern zirconia materials and compared them with lithium disilicate, discovered that they exhibited higher translucency than lithium disilicate. But this is just one study, and, even though high translucent zirconia is an exceptional material, it isn’t suitable for veneers, inlays, or onlays. If the patient requires multiple types of restorations, then lithium disilicate may still be the most suitable material due to its predictable treatment outcome and uniform shading.Most practitioners still prefer the translucency and esthetics of lithium disilicate for anterior cases. What Makes High Translucent Zirconia Better than Normal Zirconia? Translucency is affected by the way the material allows light to pass through it. With zirconia restorations, structural defects or impurities can absorb light rather than allowing the light to pass through. When light hits any structural defects, it scatters, which also reduces translucency. High translucent zirconia is manufactured to reduce the effects of impurities and structural defects. Reducing the alumina content of the material, and optimizing its distribution so that the material still retains the aging stability of traditional zirconia. A shorter sintering time at an optimal temperature to produce a smaller grain size and improved translucency. Using dyes with ionic components that are engineered to be uniformly distributed during drying and sintering. Specialized processing techniques that improve the optical qualities of the material, producing a higher refractive index and reducing the need for layered porcelain. The introduction of multilayered technology for zirconia, which increases the possibility of creating excellent translucency and multicolor dentin and enamel. Treatment outcomes can be especially good when the natural tooth abutment is a normal shade. Where this is the case, the high translucency of the material minimizes the space required for the crown, so less preparation is required than with opaque zirconia. Monolithic restorations of high translucent zirconia can also be superficially stained, increasing the esthetics of the restoration. High translucency zirconia can be used for monolithic, fully anatomical restorations, and it is also suitable for layered restorations. It has similar wear properties to previous forms of zirconia, and its smoothness isn’t affected as it ages. The smooth surface of high translucent zirconia’s prevents excessive abrasion to the opposing dentition. Zirconia is known for being highly biocompatible, with its promotion of healthy tissue response and resistance to plaque. The natural translucency and opalescence of this material transmits the color of adjacent teeth, and it can be accurately matched to any shade, all without compromising the strength and longevity of the restoration. While conventional zirconia is an unbeatable material for restoring posterior teeth, high translucent zirconia is an exciting addition, providing excellent esthetics and a higher flexural strength compared to lithium disilicate restorations. Knowing when and where to use this material isn’t difficult, but it is worth discussing cases with the dental lab, especially if your experience with this product is limited. Stump shades, the esthetic demands of the patient, and whether the patient is a bruxer & whether the tooth is RCT tooth are all factors that will influence your ultimate treatment choice.